When most people think of Brooklyn, they imagine brownstones, bookstores, parks, trees (as in A Tree Grows in Brooklyn), hipsters, and quieter charm just across the Brooklyn Bridge from Lower Manhattan. They think of that iconic bridge, too. Probably only Brooklynites think of the beaches, which are a world away from busy, glam New York City, where the sun shines mostly through canyons of buildings or filters through the leaves on those leafy Brooklyn streets. Not so on Coney Island, Brighton Beach, and Manhattan Beach Park, where the sun gets a wide expanse of sand and sparkling ocean water to play on. All are open from Memorial Day weekend through Labor Day and are free to all. Swimming is allowed at all three beaches only when lifeguards are on duty. So find some time to have a different New York experience — one that's treasured by the locals — and grab that swimsuit, towel, sunscreen, and a pair of sandals or flip-flops and head out for some summertime splendor. Once you've gotten your fill on swimming, sand, and sun, there are many activities and spots right near these beaches to fill the rest of your day. Coney Island Beach, located at Surf Ave., is easy to get to whether you're traveling by subway (on the Q, D, F, or N line) or bicycle (the Ocean Parkway bike path ends here). Fake palm trees dot this sandy stretch of beach, and its trademark boardwalk is one of the few reminders of the area's historic past as a high-end seaside resort. The boardwalk connects the Luna Park amusements and the beach, three miles of southern exposure that is one of the most famous beaches in the United States. You can't talk about Coney Island without thinking about hot dogs — Nathan's Famous Hot Dogs was founded on Coney Island in 1916, and they have been so tightly linked ever since that the word coney has become another word for hot dog to many. Any visit to New York should include this iconic experience — eating a hot dog Coney style from Nathan's in the place it all began — on Coney Island. On July 4th weekend people flock from across the country to watch the famed Hot Dog Eating Contest sponsored by Nathan's. And if the fun people-watching, hot dog-eating, and ocean-wading aren't fantastic enough, time your visit for June for the beach's annual Mermaid Parade. 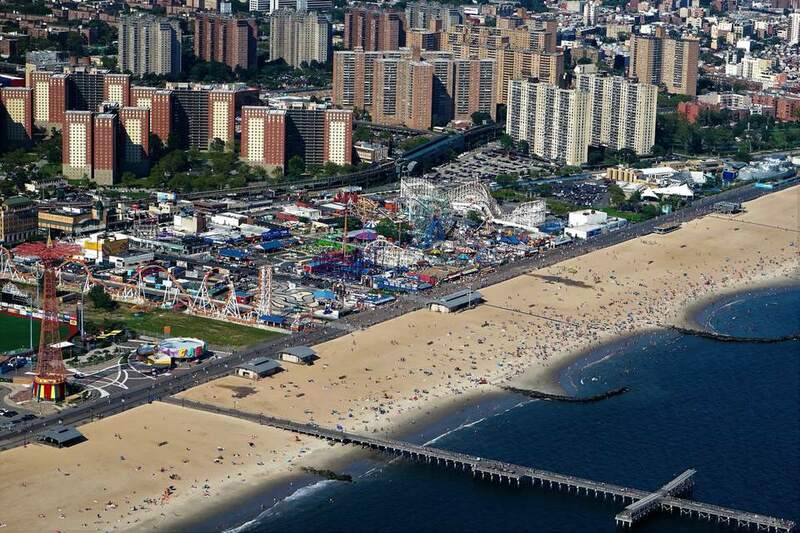 Brighton Beach is an extension of the Coney Island beach and begins at Brightwater Ave. This predominantly Russian area sometimes referred to as "Little Odessa," is filled with Russian signage and shops. Like Coney Island, its name has also become a household word, thanks to the play by Neil Simon, "Brighton Beach Memoirs." The main street is filled with ethnic restaurants and a few not to miss nightclubs. While Coney Island is in-your-face, Brighton Beach is a relatively quiet respite just a short distance from Coney. If you're looking for a day of ​good eats and shopping, there's plenty of businesses to choose from. Brighton Beach is a quick walk from Coney Island beach. By subway, take the Q or B to Brighton Beach. Located on the southern tip of Brooklyn, Manhattan Beach Park is on Oriental Blvd. on the eastern side of Coney Island, just east of Brighton Beach, in the city of Manhattan Beach. This small stretch of beach can be reached by taking the B1 bus from Brighton Beach. This is a small, quiet, less crowded beach that attracts families drawn by its tennis courts, playgrounds, and baseball diamonds. Picnicking on the beach is usually part of this day in the sun. Although this beach isn't very accessible from public transportation, it's a quiet spot for locals and worth the trip.